In an effort to become more organized, Mike Gayle creates a to-do list. This is no ordinary to-do list. It contains a mammoth 1,277 items and covers everything from ‘Read War and Peace’ (#963) to ‘Work out how to reset clock on DVD player’ (223). It includes everything Mike has been meaning to do, but keeps putting off. Much to his wife’s amusement, Mike embarks on his organizational journey and is determined to finish before his next birthday. That gives him just under a year to complete it. Will he do it? I’ve always loved Lad Lit and having read and chuckled through a few Mike Gayle novels several years back, I was happy to find the same quality and humour I’ve come to expect with his novels. This To-Do List was equal parts charming and hilarious. I loved the story and haven’t been able to stop making lists ever since - although mine aren’t nearly as ambitious! I could relate to Mike’s list, although not quite on such a grand scale and could feel the sense of accomplishment he had whenever he checked something off. It’s a feeling I know well. I’ve even been known to add things to my lists that I’m in the middle of or even something I’ve already finished just so I can cross it off. I also have a million tiny things like Mike does that I want to keep up with, but never do, so I could completely understand his initiative. This novel even inspired my 2011 To-Do List which I blogged about so could be held accountable, just as Mike did with his mass email. I didn’t go crazy with my list though. I know my limitations, and although I’d love to learn Spanish, organize my photos and try a half marathon, I’m certain this isn’t the year for that. I do however have some goals that had been floating around in my mind over the last few months of 2010 that I put to paper. Now I’ll be put to the test to accomplish them. The To-Do List has me thinking about a bucket list. I’ve also started creating lists each week which are keeping me focused, helping with my writing as well as get everything I need to done. All in all, this was a great read and a fabulous motivator! 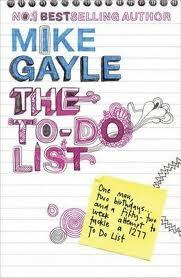 For some reason I can’t explain, though I know that this is Mike Gayle writing about his own life, family and to-do list, I occasionally managed to forget that this was actually his life. This is pretty impressive although a tiny bit scary too! His humour is always exactly right and despite featuring his family heavily in the writing I don’t think he exposed them to us in a way that could generate any evil looks from his wife. He should be commended- or perhaps he’s more in tune with his wife’s looks than my husband is? On a special note, being Canadian, I did like that his go-to organiser was a Canadian woman and have myself been known to also add “take a shower” to my own to-do list. But I learnt this from my mother (who is English) so not sure how to explain that one? One cannot be critical about a person’s actual life so I can only praise the concept of the novel, his inspiration to inspire others to get on with tacking some of those things one things one ought to do and his ability to make us laugh along the way. Oh and his wonderfully skilled writing! Fabulous!